Summary: Planning for prom’s supposed to be fun—the dress, the accessories, the devastatingly handsome date—but Quigley Johnson never thought that agreeing to her best friend Ann’s Betterment Plan would ruin her life! After a series of bizarre part-time jobs, the prospect of being a live model for a fashion-design class has Quigley ready to throw in the towel, until she meets Zander. He may not be able to sketch, but he’s smoking hot, cool and funny, and every outfit he creates might as well be made for her. But is he too good to be true? Then there’s David, the self-professed “Art King” whose competitiveness has always meant cutting Quigley down, until he sets his sights on making her his prom date and “Art Queen.” And this preparation for the formal was supposed to make Quigley and Ann even closer, but it’s tearing them apart! How will Quigley make it to prom, when she’s barely making it through high school? Fresh and flirty, Will Work for Prom Dress combines fashion, romance, and entrepreneurship in a hilarious package. 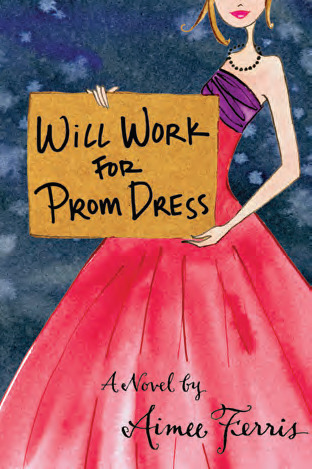 A must-have for the prom season from a talented, emerging voice in the young adult world. Why I Want It: Doesn't it sound cute? I think this is going to be a great rom com! This sounds like a fun book, but I'm not sure how I feel about the main character's first name being my last name lol. Can't say that I have ever seen that before! Sounds like a lot of fun. Good for the Project Runway crowd. haha this one looks so cute! and the title is awesome, great pick!